"While I am the word I am the light of the world." These words of Jesus from the Gospel of St. John gave impetus to the addition, by Pope John Paul II in the year 2002, of five new mysteries of the Holy Rosary. His purpose in doing so was not to innovate but to help us pay serious attention to aspects of the life of Jesus that were not included in the traditional fifteen mysteries of the Rosary but which are especially instructive for our troubled times. These Mysteries of Light focus, in a special way, on the sacraments of Baptism, Confirmation, Matrimony, Priesthood, and the Holy Eucharist: Jesus’ Baptism at the hands of John the Baptist, the Marriage Feast at Cana, the Public Life and Miracles that attended the preaching of the Lord, his Transfiguration along with Moses and Elijah in confirmation of his unique role in our salvation, and the institution of the Eucharist. 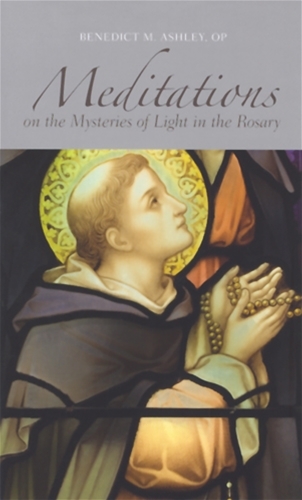 It is the author’s hope that these meditations will bring fresh life and renewed interest in the Rosary and its place within Christian spirituality as a doorway into the Heart of Christ, ocean of joy and of light, of suffering and of glory. About the Author: Benedict M. Ashley, OP is Professor of Theology Emeritus at the Aqiunas Institute of Theology in St. Louis, Missouri. A graduate of the University of Chicago with a doctorate from the university of Notre Dame, he is a master of Sacred Theology, an honor conferred by the International Order of Preachers, and the recipient of the medal Pro Ecclesia et Pontifice conferred by John Paul II. He is the author of many books and articles including two works also published by ST PAULS / Alba House: Living the Truth in Love: A Biblical Introduction to Moral Theology and Choosing a World View and Value System.